Below is a small sample of completed memorial angel carved headstones. We can offer custom designing services for you. We have access to almost any granite color. Please contact us for details. This intricately detailed solid granite upright cemetery memorial features a beautiful angel, flowers and a heart that can be personalized. This memorial is available in a variety of sizes and colors. For more information please contact us. This beautiful upright grave memorial features a highly detailed angel playing a harp and standing beside a large heart that can be personalized to fit your needs. This monument may be ordered in a variety of sizes and colors. For details on what is available please contact us. 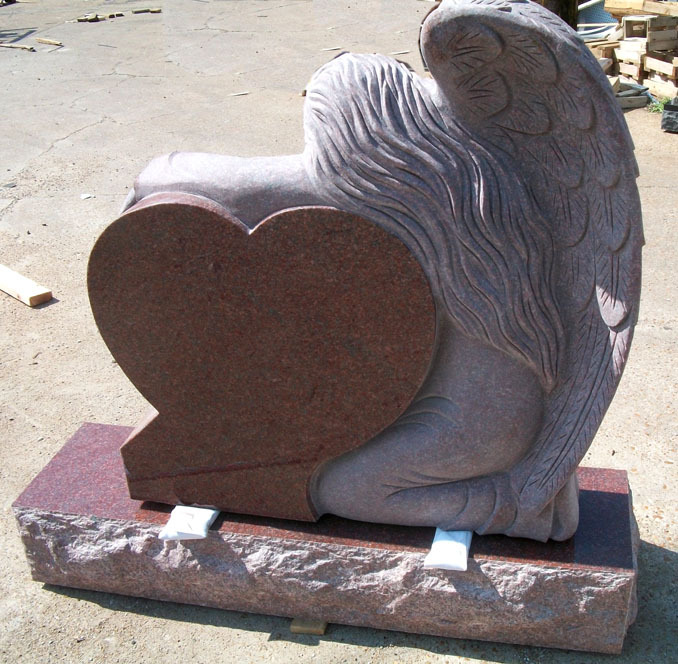 This beautiful solid granite upright headstone features two intricately detailed cherubs at the bottom and a two large heart shaped areas that can be personalized to your specifications. This headstone is available in a variety of sizes and colors so please contact us for more details. 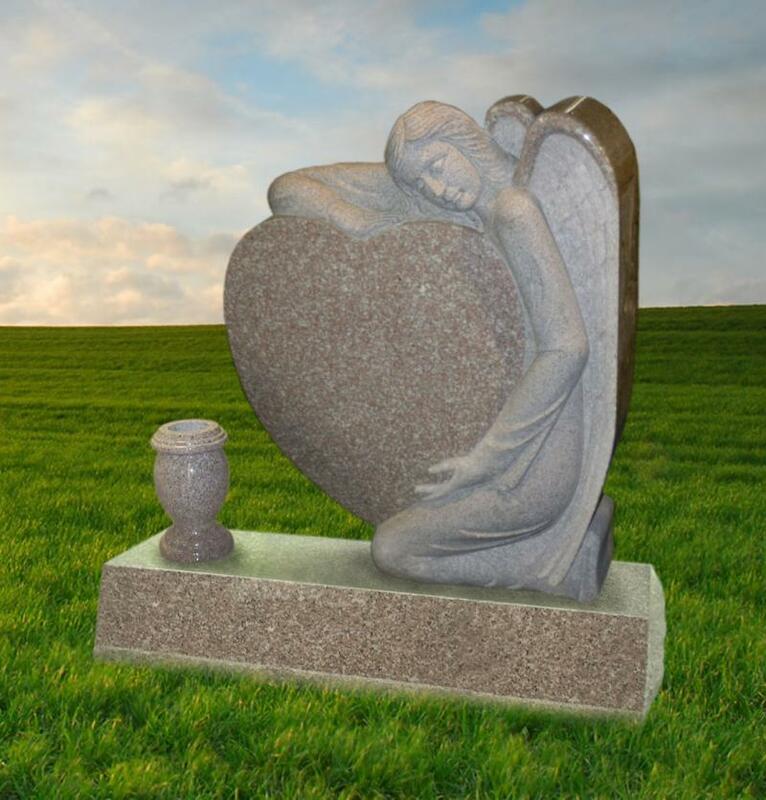 This striking solid granite angel monument features a solitary angel embracing a heart as she mourns the loss of your loved one. 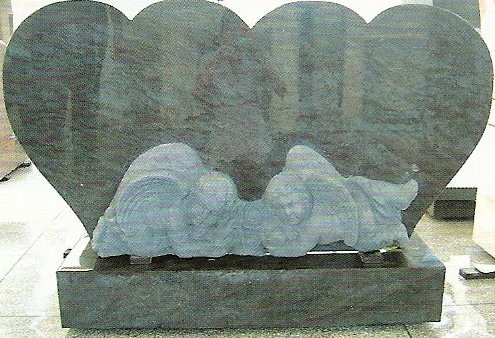 This monument is available in a variety of colors and sizes. Please contact us for more details. 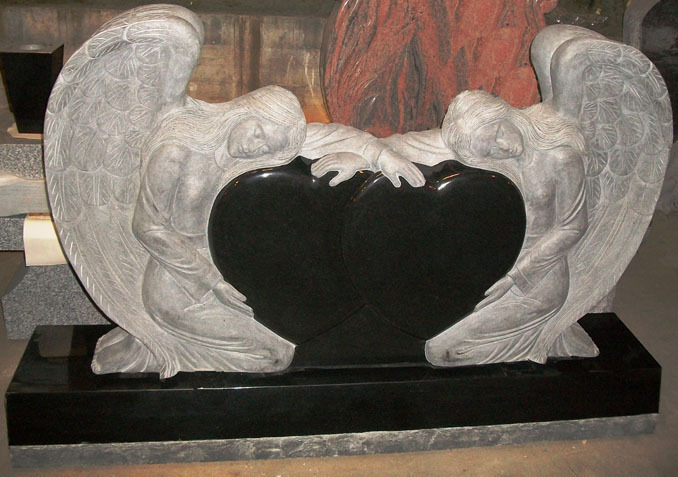 This solid granite upright tombstone features two angels lovingly embracing a jet black heart that can be personalized to your specifications. This tombstone is available in a variety of colors and sizes. Please contact us for details. 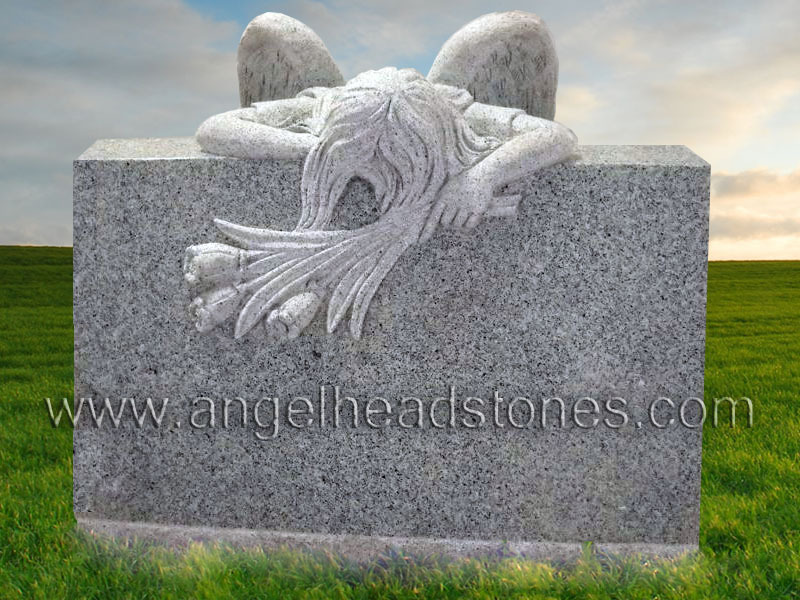 This solid granite jet black headstone features a beautiful angel and plenty of room for personalization. 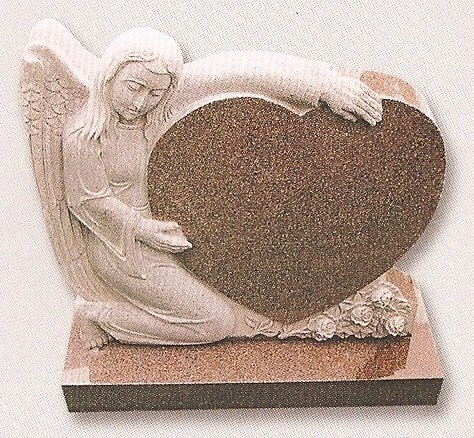 The solitary angel headstone is available in a variety of colors and sizes. Please contact us for details. 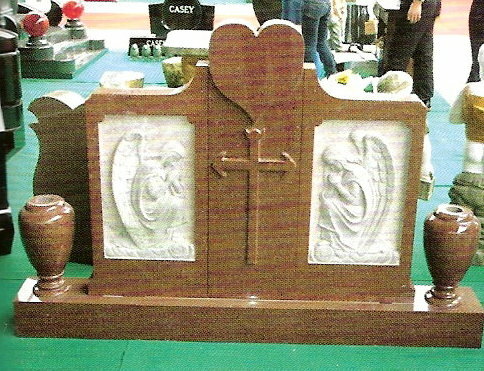 This elaborately designed solid granite grave memorial features three dimensional shape carvings of angels, hearts, and a cross. In additon to all of the beautiful designs this memorial also features two vases. This grave memorial has plenty of room for personalization and is available in a other colors and sizes so please contact us for details. This gorgeous angel monument is a slant style memorial and it features a highly detailed carved angel leaning over the front of the monument mourning the loss of your loved one while clutching a bouquet of tuilips. The back (as shown below) is also carved and includes intricately detailed wings. 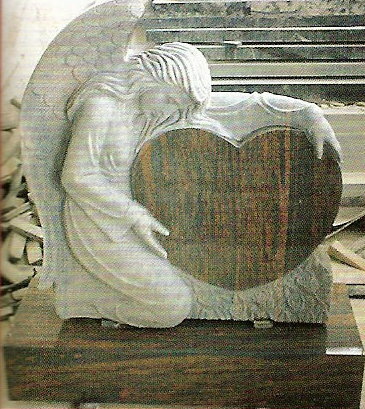 This angel monument is available in a variety of granite colors so contact us with your design ideas for a custom price quote and more information. This jet black headstone is simple in design but features an intricately detailed standing angel who rests on the left side of the headstone. This headstone is available in other colors and sizes. Please contact us for more details. This upright solid granite memorial features a mourning angle embracing a rounded headstone with plenty of room for personalization. The solitary angel is simple but beautiful and is available in a variety of colors and sizes. For more information about this striking memorial contact us. This beautifully detailed angel is embracing a polished heart and rests on a bevel style base . 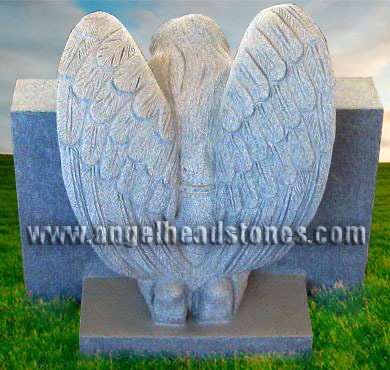 This angel monument is available in a variety of granite colors and sizes so contact us with your specific design needs and we will provide you with a custom quote. This enchanting angel monument features a child like angel glancing upward as if watching your loved one up in Heaven. This beautiful memorial also features a delicate single long-stemmed rose draped across the top of the memorial. 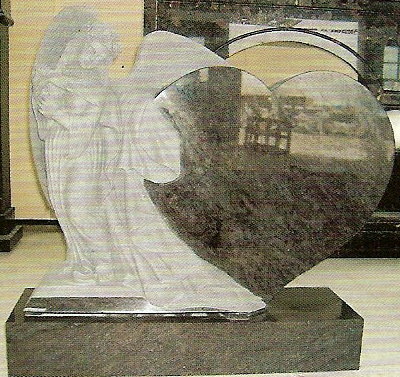 This angel monument is available in a variety of granite colors and sizes so contact us for more information and a custom price quote. This beautiful angel monument features a highly detailed angel with flowing hair and feathered wings resting her head on her knees as if pondering the mysteries of life as dragonflies swirl about. A great choice of angel monuments for your loved one who enjoyed the wonders of the world. 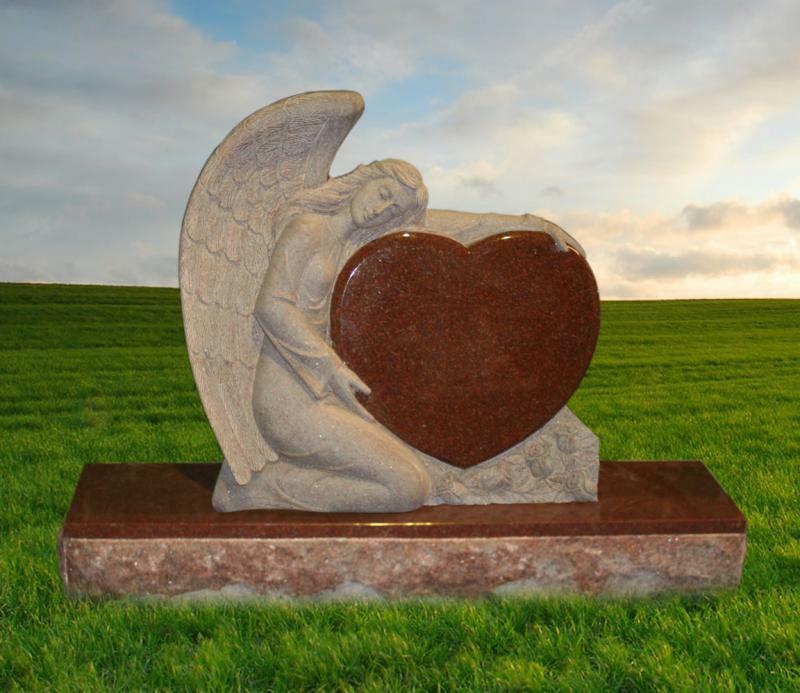 This angel monument is available in a variety of sizes and granite colors so contact us with your specific needs and we will assist you in creating the perfect tribute to your loved one. 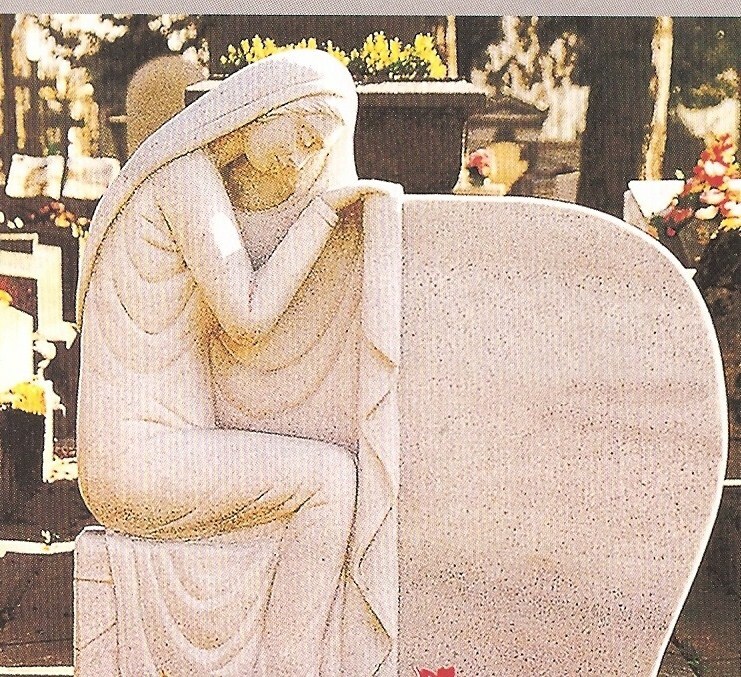 This beautiful angel monument features an angel knelt in prayer beside the memorial of your loved one with her head bent in grief as she watches over them with a bouquet of flowers in her hand to lay upon the grave. A peaceful and beautiful carved angel monument that would be a tribute to a life well lived. Available in a variety of granite colors and sizes. This lovely carved angel monument features a highly detailed angel kneeling and embracing a polished heart all of which is resting on a bevel style base. This angel monument is an excellent way to show your eternal love and devotion to those you have lost. Available in a variety of granite colors so contact us today with your specific design needs and we will provide you with a custom quote. 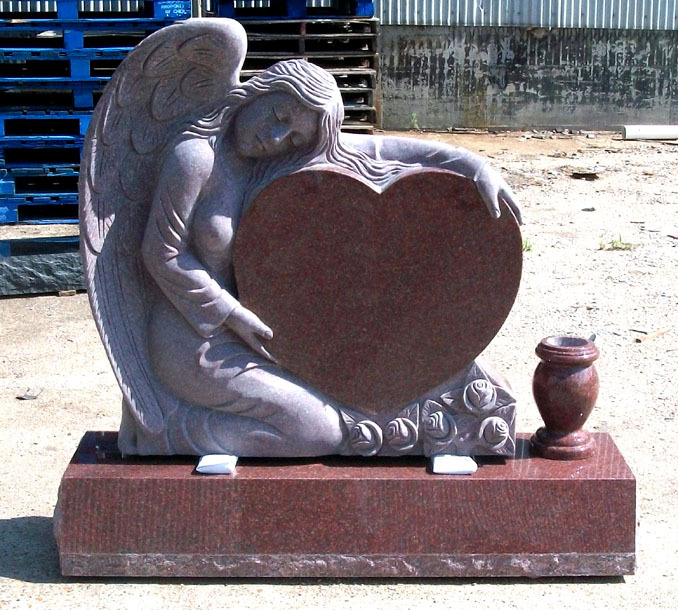 This beautiful and feminine angel monument is shown here in our High Quality Solid India Red Granite but it is available in a variety of granite colors. The angel is highly detailed on both the front and back (as shown) and features delicately carved flowers at her knees and individual feathers on her wings. 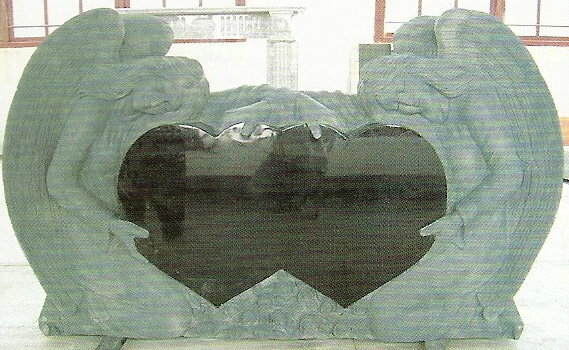 An awe-insipiring angel monument that will pay tribute to your loved one and the love you shared . 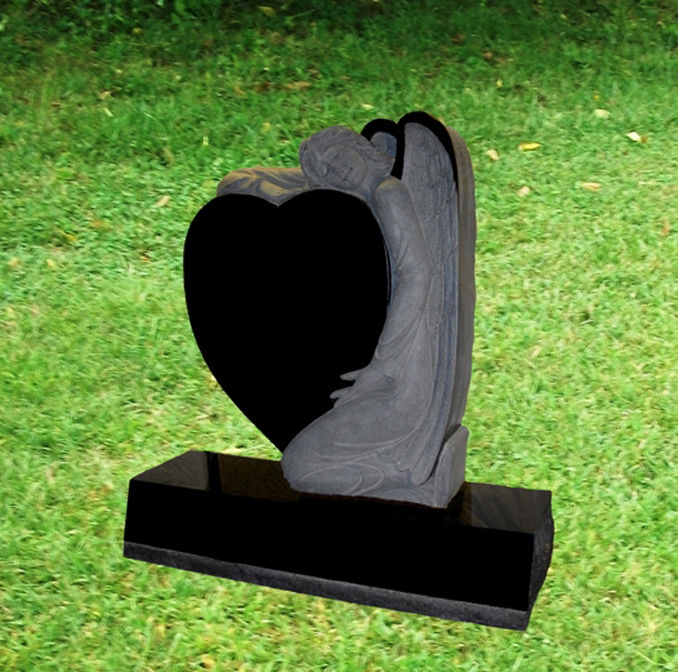 This angel monument is shown here in our high quality solid jet black granite, but it is available in a variety of granite colors. This pair of intricately carved angel are embracing a pair of polished hearts and is versatile enough to be used as a companion memorial or for an individual. The delicate features of the carved angels make this angel monument especially eye-catching. This impressive angel monument features a carved angel holding a polished heart resting on a bevel style base with a turned style vase. An excellent choice if you are looking for a simple, yet beautiful angel monument. Available in a variety of granite colors so contact us with your personal design needs. 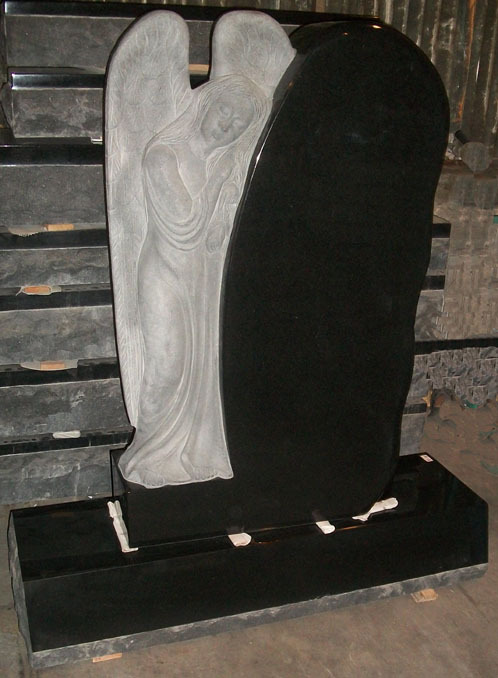 This remarkable Leaning Angel Upright Monument features an intricately carved angel with a flowing robe, delicate features, and individual feathers on the wings who is leaning upon a polished jet black granite upright memorial as if she is peacefully resting while guarding your loved one for all eternity. A beautiful and classic choice in angel monuments. Shown here in our high quality solid jet black granite, but available in a variety of granite colors. 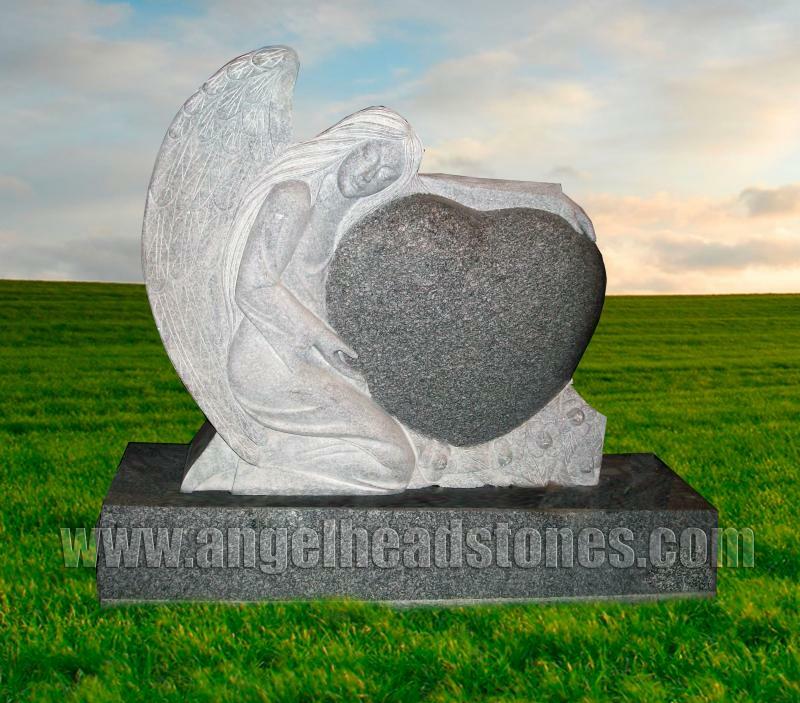 This upright heart-shaped headstone features an angel wing design and is made of jet black granite. This memorial may be ordered in any size or color. Contact us for details. Copyright 2009 Angel Headstones. All rights reserved.